Engineering Letters is published with both online and print versions. 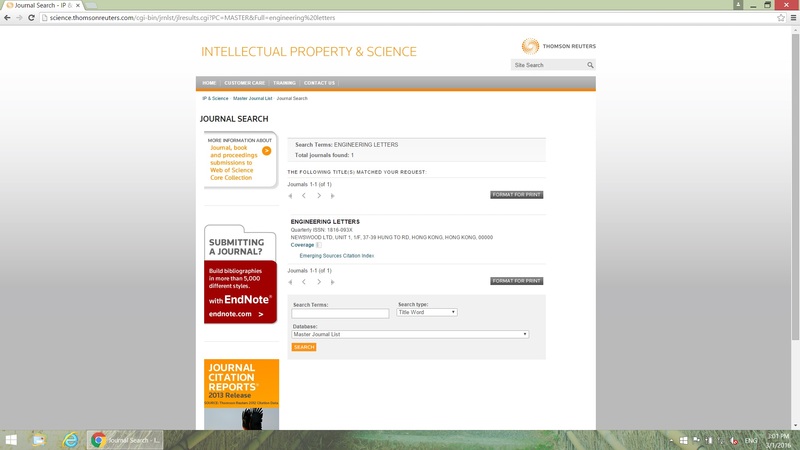 The journal covers the frontier issues in the engineering and the computer science and their applications in business, industry and other subjects. The computer science is a branch of engineering science that studies computable processes and structures. It contains theories for understanding computing systems and methods; computational algorithms and tools; methodologies for testing of concepts. The subjects covered by the journal include artificial intelligence, bioinformatics, computational statistics, database, data mining, electronics, financial engineering, hardware systems, imaging engineering, industrial engineering, information engineering, internet computing, networking, operations research, scientific computing, software engineering, telecommunications, and their applications etc. Printed copies of the journal are distributed to accredited universities and government libraries. All the papers in the journal are also available freely with online full-text content and permanent worldwide web link. The abstracts will be indexed and available at major academic databases (like for example Scopus, EI Compendex and Clarivate Analytics (formerly Thomson Reuters) Emerging Sources Citation Index). Engineering Letters welcomes author submission of papers concerning any branch of the engineering and the computer science and their applications in business, industry and other subjects. The subjects covered by the journal include artificial intelligence, bioinformatics, computational statistics, database, data mining, financial engineering, hardware systems, imaging engineering, industrial engineering, internet computing, networking, operations research, scientific computing, software engineering, and their applications.